Residents of Jackson and Manhattan Townships, in Will County, Illinois and surrounding communities against NorthPoint Development's Compass Business Park proposal. Join us in the fight to save our community. 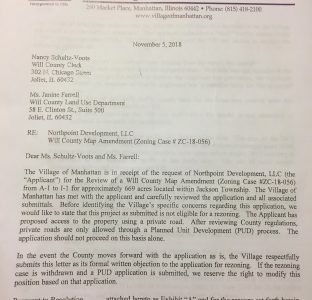 Read More "NorthPoint’s County Application: Status Update"
Read More "News & Update Recap"
Read More "National Press for Just Say No to NorthPoint"
Read More "Village of Manhattan Says NO to NorthPoint"